The first thing is to realise that the Lord has a specific and unique plan for you. He's had this plan in mind before you were even born. You are not a mistake going somewhere to happen. You haven't been placed on this earth by chance. Where and when you were born, the parents God gave you, your personality, and everything else about you was orchestrated by God for a specific purpose. But this doesn't mean God's will is automatically going to come to pass in your life. It won't. God's will doesn't always come to pass. Take salvation, for instance. The Lord is not slack concerning his promise, as some men count slackness; but is long-suffering to us-ward, not willing that any should perish, but that all should come to repentance. It is clear from this scripture that God wants everyone to come to repentance and be saved, yet we know that not everyone does. God also wants everyone healed (3 John 2), yet people still live with sickness in their bodies. Likewise, God wants everyone to find and walk in the purpose He has ordained for them, yet not everyone will. But that's not God's fault. Once you realise you are the one responsible for discovering God's will, the next step is to start seeking Him for it. He's not hiding His will from you, but you are going to have to do some seeking to find it. Then shall ye call upon me, and ye shall go and pray unto me, and I will hearken unto you. And ye shall seek me, and find me, when ye shall search for me with all your heart. Notice the emphasis on seeking with all your heart. As long as you can live without knowing God's will for your life, you will. But when you seek with all your heart, you will find His will (Matthew 7:7). When I was a senior in high school, I was faced with having to know what God's will for my life was. I needed to know if I was supposed to go to college, or what path God wanted me to take. I asked people in my church how to find God's will. Nobody could tell me what to do. Present your bodies a living sacrifice, holy, acceptable unto God, which is your reasonable service. And be not conformed to this world: but be ye transformed by the renewing of your mind, that ye may prove what is that good, and acceptable, and perfect, will of God. For the next four months, I meditated on those scriptures. It was shortly after that when I had my life changing encounter with God. As a result of that encounter, I began to see that God had called me to be a full-time minister. I don't think it was any accident that He showed up in such a miraculous way in my life at that time. It was because I had been diligently seeking Him, wanting to know the path He had for me. One mistake people often make in seeking God's purpose is that they assume that whatever they're good at in the natural must be what God wants them to do. So, if they're naturally good at public speaking, they figure that God must have called them to a speaking ministry of some sort. I don't believe this is always true. It certainly wasn't true in my case. I was scared stiff of speaking in front of people. God called me to do what is beyond my natural ability so that I would have to rely on Him to get it done. That's why God's will may have nothing to do with your natural gifts. If you can do something yourself, naturally, you wouldn't need God's empowerment. Sometimes people's talents may be an indication of what God's will is, but many have gifts and talents they don't even know exist. Paul said that God had separated him from his mother's womb and called him by His grace (Galatians 1:15). God purposed for Paul to be a minister of the Gospel before he was ever born. He didn't look at Paul's talents once he grew up and then decided He could use him. His life had been predestined, just as yours is. So, if you only look at what you're good at to determine your purpose, you may totally miss it. God's perfect will is definitely worth finding. Supernatural peace and joy come when you're in the centre of His will, and God's blessing and anointing will always be on your work when you are doing what He's called you to do. Did you know that finding God's will is not enough? It's only the first step. Some people get a revelation of God's general will for their lives but then stop seeking Him for direction on how to carry it out. Knowing God's will is critical, but after that, you must learn how to follow His will and cooperate with Him to bring it to pass. People may stumble across God's will but then decide they can carry it out in their own strength. They think they have God's plan all figured out, and they don't take time to discover how He wants to accomplish His will through them. Another problem is that people often won't take time to prepare for God's will to be fulfilled. They are moved by the need that's around them, and they feel pressured into hurrying to bring God's plan to pass. You can't speed up the things of God, but you can certainly delay them. Moses found this out the hard way and ended up delaying God's plan by thirty years. He took matters into his own hands and killed an Egyptian, thereby totally missing God's plan and timing for the Israelites' deliverance. It ended up costing Moses forty years in the wilderness, which was not God's original plan. Throughout the Bible, we see examples of God preparing His people for the ministry He called them to. David waited thirteen years from the time he was anointed to be king, until he actually became king. Moses had to wait ten years. Paul had to wait fourteen. And then there was Abraham, who had to wait twenty five years, until he was 100! God always calls you to do something totally beyond your own ability because He wants you to depend on Him. It's important that you wait and do things His way and in His timing, not only for yourself, but also for those He has called you to reach. Many Christians will master the first step of finding God's will for their lives and then follow His will by continually seeking Him for direction, but once God actually gives them specific steps on how to walk in His will, they come up with a million excuses as to why they can't do it. I see this over and over again with prospective Bible college students. So many have told me that they know God wanted them to come to our college years ago, but for whatever reason - parents, children, pets, you name it - they didn't come. The truth is, if you wait for everything in your life to line up perfectly before you obey God, you never will. If God has told you to do something, don't try to figure out how it will work or where the provision will come from. God told Elijah to go to a certain place and that He would provide for him when he got there. (I have a teaching on this called, "A Place Called There.") Elijah had to act in faith and go to the brook if he wanted to see God's provision. You will miss a lot if you don't obey God. If you want to finish your race strong and do all that He has planned for you, you must obey the steps He gives you. There are no shortcuts! Now God will still love you - you will still be His child, you will still make it into heaven, and He will still use you in His kingdom - but you won't fulfil His perfect will for your life. In order to walk in the fullness of what God has for you - the good of the land - you must obey all He tells you to do. Many of you have something that God has impressed on your hearts to do, and for whatever reason, you just haven't done it. Stop making excuses and get started! If you don't know exactly how to do it, pray and ask God to give you wisdom (James 1:5-8). If you feel dissatisfied or unsettled with your life and are tired of just going to work, coming home, watching television, going to bed, and getting up and doing it all over again, it may be God prompting you to start seeking out His perfect will. Don't wait another day to begin the search for God's will in your life. 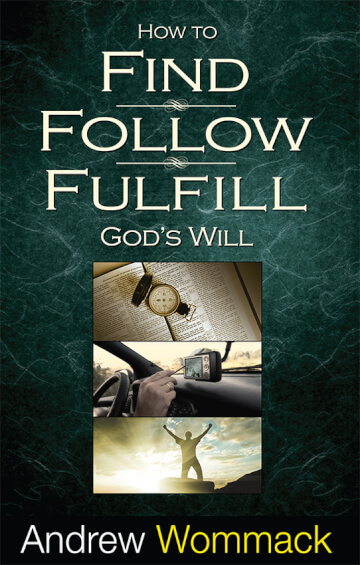 To help you in this effort, I have released a new book: How to Find, Follow, and Fulfil God's Will, accompanied by three study guides. I also have a series of three, five-part teachings: How to Find God's Will, How to Follow God's Will, and How to Fulfil God's Will. I believe this teaching will literally change your life if you apply these principles.